Above is a full size replica banner of the 42nd Guards Rifle Regiment, which was part of the 13th Guards. It was custom made for the group in 2018 by Mianbro Enterprises, Pakistan from images of the original banner, which is currently displayed in the Panoramic Museum "Battle of Stalingrad" in Volgograd. Welcome to the home page of the 13th Guards Rifle Division. The 13th Guards Rifle Division is a living history group those aim is to accurately portray the men and women of the Red Army who served during World War Two, or The Great Patriotic War as it is known in Russia and the former states of the Soviet Union. The unit was founded in 2005 by a few enthusiasts in the North-East of England and are currently members of the Northern World War Two Association. The Association takes part in period living history and battle re-enactment displays for the general public, mainly in the north of England region of the UK. No extreme political, racial, homophobic views or activity etc. will be permitted within the unit, however some period political reference maybe made in the interest of historical accuracy. Membership is not gender specific and is open to both male and female applicants who have an interest in the Red Army and The Great Patriotic War. charitable organisations here in the UK. In the 13th Guards members own period Soviet vehicles, including a T34/85 tank, a GAZ 67 utility vehicle, a GAZ-AA Truck, a Jeep (Lend Lease impression) a Dnepr Russian motorcycle combination as well a two other combination examples under restoration. Also in the collection we have a Soviet Model 1937 45mm Anti Tank Gun. The vehicles are regularly displayed at our various events. The "Red Banner" is the units own news letter, which is published quarterly for its members. The news letter, the Commissariat's Store and Unit Rules & Protocols are accessible only to unit members. Go to the Contact page for information on how to contact us or join the 13th Guards and how to view the events page and access the NWW2A forum. NOTE: The 13th Guards are not affiliated to and do not have any connection with any other Soviet re enacting group(s) within the NWW2A. 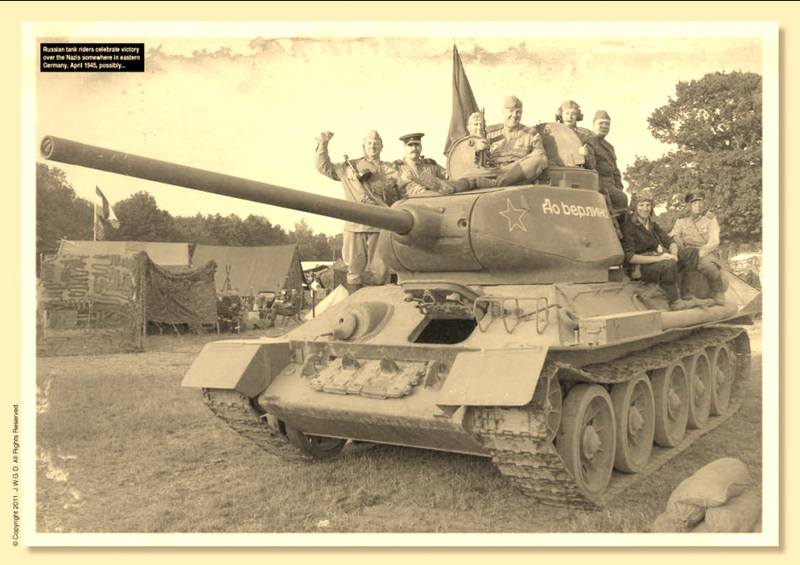 13th Guards members with comrades of the 2nd Guards Tank Army, Beltring 2010. Image reproduced with kind permission of John Woolford (J.W.G.D). Copyright: All rights 2011 the 13th Guards Poltavaskaya. The 13th Guards are recruiting now! Do you have an interest in the Great Patriotic War or the Red Army and would wish to join a group of like minded re enactors? The 13th Guards are actively looking to recruit new members now. If you would like more information on participating in this interesting subject and period of living history, then please get in touch via our Contacts Page. Comrade Stalin, portrayed by unit member Brian.